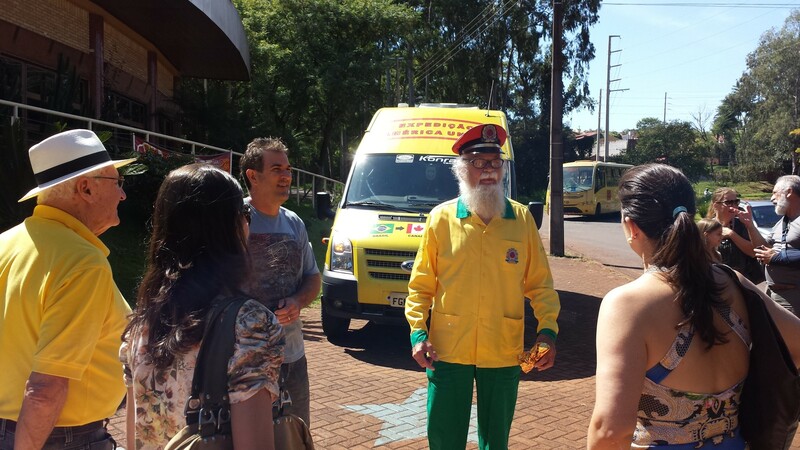 Equipped with his ideas, his unique style and a bright yellow van complete with a hybrid tracking solution, Brazilian entrepreneur Klaus Nixdorf traversed 35 countries in the Americas to spur dialogue on trade and opportunities in his own country. For over six months and with the support of investment firms and Rotary International (and with ORBCOMM partner OnixSat supplying the vehicle tracking solution), Mr. Nixdorf travelled across the Americas speaking with various companies. His discussion explored how to open markets, stimulate exports, reduce barriers for foreign exchange, enrich the Brazilian industrial landscape, and encourage investment sand job creation. The mission yielded many interested ideas, including making a common currency across the continent (as in Europe) as well as reducing transaction bureaucracy and border corruption. Mr. Nixdorf’s mission was impressive in its scope and purpose, not to mention theway he toured all 35 countries. Using a modified van aptly named BRASILMÓVEL, Mr. Nixdorf travelled 60,000 km to reach the various destinations, often through dangerous parts of the continent. The vehicle was tracked by Brazilian tracking company OnixSat using their OnixSmart 2 Hybrid solution. The solution is a dual satellite-cellular tracking solution that provided position reports regardless of location. The satellite portion of the solution is enabled by ORBCOMM’s SkyWave IDP-680 device, which uses the IsatData Pro satellite service for tracking vehicles and other assets in the most remote areas of the world. For the expedition, the solution was equipped with a panic button for the security of Mr. Nixdorf. OnixSmart Hybrid 2 was also configured to enable text messaging via satellite in order to avoid overages and tariffs as the expedition crossed international borders. Followers of the expedition had online access and live feed of the location of the van courtesy of Onixsat. The trip was aonce-in-a-lifetime adventure for Mr. Nixdofand he plans to document his trip and findings in an upcoming book. To learn more about the expedition, go to http://www.uwainternational.com.br/blog.